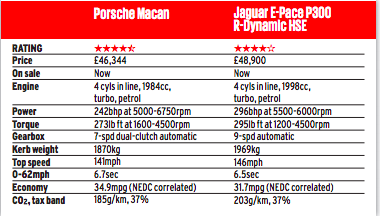 Despite having a lot less power, the Macan does seem to make better use of their 4 cylinder engine. Hard to believe that something with 50 less horsepower has only lost .2 seconds in the 0-60mph sprint. Goes to prove just how important torque is off the line. You would think the two extra gears would help the E Pace to be the more economical car as well. Their commitment to electric mobility is what's going to to give them the real upper hand. I've already heard they have a fully electric SUV coming in the next few years, that will be similar in size and design to that of the current Macan. I feel that will only last for so long. In the short term when its a race to launch as many EV's as they can, being first has its perks but once everyone catches up, the real challenge begins. Even Jaguar mentioned the idea of becoming solely an EV brand, because this is going to be the next big market by 2020. Most of the specs we are seeing from new electrics are fairly comparable from one brand to the next, so most of the decisions will be based upon badge preference/familiarity.